Sealaska Heritage Institute (SHI) will kick off its biennial Celebration next week, marking the 36th year since the inception of the popular dance-and-culture festival. It’s a time when Tlingit, Haida and Tsimshian people come together to celebrate their cultural survival and also to share their cultures with the public, said SHI President Rosita Worl. Nearly 2,000 dancers from 43 dance groups will participate this year. Along with dance performances, Celebration features associated events, including a Native Fashion Show, a Juried Art Show and Competition, a Juried Youth Art Exhibit, a Northwest Coast Art Market, Native food contests, a Toddler Regalia Review, film screenings at GoldTown Theater, and a parade through downtown Juneau. SHI is also introducing a few new events, including a poetry gathering, a regalia care workshop, a modeling workshop, a designer workshop, a Baby Raven Celebration, a film screening in the clan house at Sealaska Heritage and three research projects. SHI this year also added a new category to its Native food competition: best seal oil. (See accompanying press release “What’s New”). Events will be held in numerous venues, including Centennial Hall, the Walter Soboleff Building, the Juneau Arts and Culture Center (JACC), the Elizabeth Peratrovich Hall, Marine Park, and Gold Town Theater. 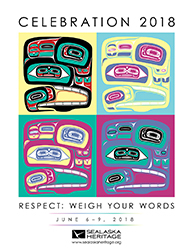 The 2018 theme is “Respect: Weigh Your Words,” which harkens to a core cultural value known as Wooch Yáx in Tlingit, Gu dlúu in Haida, and as Ama Mackshm in Tsimshian. The Celebration 2018 art was designed by Tlingit artist Alison Marks and inspired by the theme. Celebration 2018 will be led by two interrelated clans from the Haines and Klukwan area: The Eagle Shangukeidí—led by Clan Leader David Katzeek and the Raven Lukaax.ádi—led by Clan Leader Nathan Jackson. The first event will be a presentation by Ravenstail and Chilkat weavers from 11:30 am to 2:30 pm, Wednesday, June 6, in the clan house at the Walter Soboleff Building. The presentation will be followed at 4 pm by the awards ceremony for the Juried Art Show and Competition and Juried Youth Art Exhibit (See accompanying press release “SHI to unveil winners of Juried Art Competition, Juried Youth Art Exhibit”). The Grand Entrance procession into Centennial Hall will begin at 6 pm at the Elizabeth Peratrovich Hall and Celebration will wrap on Saturday, June 9, with a Grand Exit procession. SHI will sponsor a live, statewide broadcast of Celebration on public television’s 360 North and a live webcast. Live coverage will begin with Grand Entrance on Wednesday. Tickets will go on Friday, June 1, at the Sealaska Heritage Store in downtown Juneau. Ticket sales will move to Centennial Hall at 9 am, Wednesday. Four-day passes are $35 for adults, and $15 for Elders and youth (ages 7-12). One-day tickets are $18 for adults, and $10 for Elders and youth (ages 7-12). Children ages 6 and under are admitted at no charge. Dance group schedules will be published in the program, which will be available at the SHI Store beginning Monday, June 4, and at the admissions tables at Centennial Hall and the Elizabeth Peratrovich Hall. Major sponsors of Celebration 2018 include Sealaska, Alaska Airlines, Southeast Regional Health Consortium, BP Alaska, Rasmuson Foundation, Sitka Tribe of Alaska, GCI, Salon Cedar, Southeast Stevedoring Corporation, Wells Fargo Foundation and Wostmann & Associates. A list of all sponsors will be published in the Celebration program and broadcast during the event. The Juried Youth Art Exhibit was sponsored by Kathy Ruddy of Juneau. Caption: Celebration 2018 art designed by Alison Marks.